Well, what a start to the year that was! With the masses assembling for the Mid Sussex season opener, even the weather decided to give us all a break. Stacked line-ups, people literally hanging on to the last minute to get a space. Nobody wanted to miss this one! The track tore up well. Definitely the best I’ve seen Mildenhall so far this year. Which was only complimented by the fact that each class boasted an extremely high calibre of riders; permitting some enticing and exhilarating racing for spectators (I’m sure a few parents don’t have fingernails left going into this week). So, with the obligatory intro’ out of the way. Let’s talk racing! The Autos were first to face the gate drop, and it’s so crazy that all of these tiny people are able to ride so quickly. 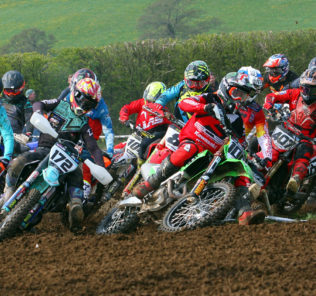 I rode the track on the Saturday, but not once did I rail a bank the way Archie Edwards did! Hearing those little 50cc bikes on the limiter as they storm down the start straight, really puts in perspective everything we all know and love about the sport. But who emerged victorious from the midst of all the action? It was the #111 machine of Alfie Geddes-Green taking all three chequered flags. Coming under fire from MBO Power’s Archie Edwards throughout the day, Geddes-Green kept his composure as he assumed the top step of the podium. Edwards humbly settled for second overall, going 2,2,2 and wearing his heart on his sleeve in every race. Meanwhile, Chase Panter looked impressive throughout the day, putting his little machine right where it needed to be to take the final step of the podium. Harvey Antrobus found his way to the head of the pack in moto one, yet he was unable to repeat his opening performance in the final motos, Warren Clarke then picked up the next two race wins. Clarke gapped his competition in the second and third motos by a margin of more than ten seconds, proving his worth and graciously claiming the overall by the end of play. Behind Clarke, Antrobus was forced to settle for second, a single point ahead young rider, William Murphy, who went 3, 2, 3 for a modest and commendable third place overall in the Junior class. efforts of your top three riders will be noted. This would take far too long if I were to write about everyone, let’s be honest. So, here we go. The Small Wheels experienced a master class from Kiean Boughen in all three motos. Dominating his group and charging to the overall with ease, it just all seemed too easy for Boughen, as he pilfered three race wins as if it was routine. Even with that said, let’s not discredit second place finisher Bayliss Utting, who stretched out a sizeable distance between himself and the rest of the field throughout the day. Securing a triad of runner-up positions Utting’s efforts were admirable to say the least. Behind him, third place overall was awarded to Archie Fremel. Experiencing pressure from a few of the other riders as the day transpired, Fremel persisted to steal the final step of the podium. If you stuck around long enough to watch these guys, then I think you too would agree that some of the best racing on the day came from this class. The final Big Wheel race in particular, provided one of the most exhilarating displays of racing I’ve ever bore witness to. The top ten guys all looked hungry for the moto win; but as with all things in racing, only one can rise to the top. Dexter Milbourne would be the one to clench all three motos. A step ahead of the rest of the field, and even when faced with adversity, Milbourne retained equanimity as he assumed the role of victor in the Big Wheel class. Last year’s Mid Sussex MCC Small Wheel Champion, Leon Ongley stuck his #72 machine in solid positions throughout the day, providing him with the edge to grab second. Whilst Harrison Forde, finishing on equal points to Ongley, found himself demoted to the final podium step as Leon bested him in the final moto. So Ike, what did you think of the opening round of the Mid Sussex Championship at Mildenhall today? There were some pretty fast guys in your group, it must be a confidence boost to see you’re already putting your GL12 machine at the front of the pack and winning by a convincing margin? You’re clearly right at home on the 125, but what would you say are the things you still need to work on coming away from Mildenhall? It was great to watch you ride, is there anything else you’d like to add? Behind Carter, Toby Avis and Todd Leadbitter battled for second overall. Going in to the final moto on equal points, it was Avis that would emerge victorious from the rivalry and force Leadbitter down to settle on to the final podium step. Simultaneous, the Youth 125 group was won by Jordan Ward on his Yamaha. Rounding the day off on a total of 123 points, and leaving with the overall ahead of the likes of Billy Smith, Kieran Thomas and Callum McCaul. exciting new breed, offering a broad range of talents throughout the gaggle, it would appear that these ‘weathered’ dudes can definitely still throw down when it matters! Justin Collier would be the man to clamber to the head of the mantle at the close of play. Collier proved the value of consistency as Paul Williams, despite taking the wins in the opening and closing motos, could not replicate his performances in the middle race, thus pilfered the overall and forced to accept second. A solid trio of races for Rory Wootton permitted him to rise to the last remaining place in the top three of the VMX class. Meanwhile, in the Women’s class (although sparsely numbered), Louise Powell racked up 135 points and the early championship lead, as Lucy MacTaggart claimed second overall. talent, the Adult Open class did not deprive spectators of exhibitions, packed with an abundance of top quality racing. Albie Wilkie, holding out to the very last moment to secure a ride at the Mid Sussex season opener, made the most of his track time and charged his Evotech KTM to the front of the field in every moto! In fine form, Wilkie is definitely a man on a mission this year. As Albie disappeared into the distance, James Coker managed to accumulate enough points to ascertain second overall by the final moto. Two points behind Coker, Justin Robinson, with an array of mixed results managed to grasp the last podium place firmly with both hands. Unfortunately Matt Dowse, who looked to be in great shape in the opening moto, was decommissioned in the second following an accident early on. We look forward to seeing what he can put together in the meetings to come. So, that was your opening race report. I’ve been Marc Carter, and you’ve managed to get to the end of the report, it’s been a pleasure.